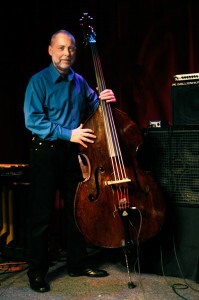 The Smith is thrilled to have National Endowment for the Arts Jazz Masters Kenny Barron (piano) and Dave Holland (bass) perform here April 6 as part of our 125th Birthday Series, as well as the 6th Annual Scott LaFaro Day Celebration. This promises to be a very special show. We caught up with Dave Holland by phone and asked him a few questions. Here are his responses (edited for brevity). Q: You will be in Geneva as we celebrate our hometown jazz hero, bassist Scott LaFaro (who died tragically in 1961 at the age of 25). Did you listen to him growing up? What were your impressions? HOLLAND: Scotty is one of my heroes. I think I was about 18 or 19 when I first heard him. I was at a party, there were some musicians there, and one of the musicians lived at the house. He played for me “Sunday at the Village Vanguard” (the album by Bill Evans and his trio, bassist Scott LaFaro and drummer Paul Motian). It changed my whole perspective of what was possible on the instrument. Once in a generation someone redefines the instrument they play, and Scotty did that. Q: You were born in Wolverhampton, United Kingdom in 1946. What kind of jazz musician has growing up in the UK made you? HOLLAND: That’s such a hard question. The working class kids in the U.K. who were drawn to American music, were drawn through the same channels as kids in America: Chuck Berry, Buddy Holly, Ray Charles, Little Richard, all coming to the UK from America. We all saw it as a way to move out of the reality we experienced in our lives, which was the very industrial setting where I grew up in The Midlands, like a glimmer of an incredible other world that could happen. African-American music has been the informative thing for me in my playing. As soon as I got the opportunity I came to New York and have been there since. Q: How do you decide to do musical collaborations? HOLLAND: How do you choose your friends? You feel something, there is an affinity that is unspoken, with no need to say it. Good friends also have different points of view and can share them with you. It’s kind of like that with music. You sense a certain affinity, not just about music but about the spirit of that person, that makes you want to enter into a mutual conversation with the music. Q: What about your collaborations with Kenny Barron? HOLLAND: Kenny invited me to do a record with him, a trio, in the late 1980s. It was the first time we played together. He already had a distinguished career. He played with Dizzie Gillespie and Stan Getz. He is an amazing person, carrying the tradition in his music, and at the same time has added his own style to that tradition. He has kept it relevant to modern times as well. He is a wonderful gentleman, a really nice man, I can’t put it any clearer than that. He is very easy to work with, he is a great listener, a great composer, brings wonderful songs to a situation, and he has an amazing knowledge of the repertoire of music from all different periods. He is really a walking history of music. Q: You seem to have a great respect for your audience. What does your audience teach you? HOLLAND: Communication. You learn presentation and how to frame what you do musically and have it be communicated to people. That is not to say you hit the lowest common denominator, but you try to present what you are imagining and thinking about in a way that gives people a chance to have an entry point into it. Not everyone is going to connect with it. I have people who say they can’t understand jazz, there are no words to it and they have barriers to instrumental music. They say it’s too complicated. I say, just open your heart and let emotions take over. It’s not about understanding the technicality of it. Q: What is the best jazz advice you have ever gotten? HOLLAND: Play from the heart.